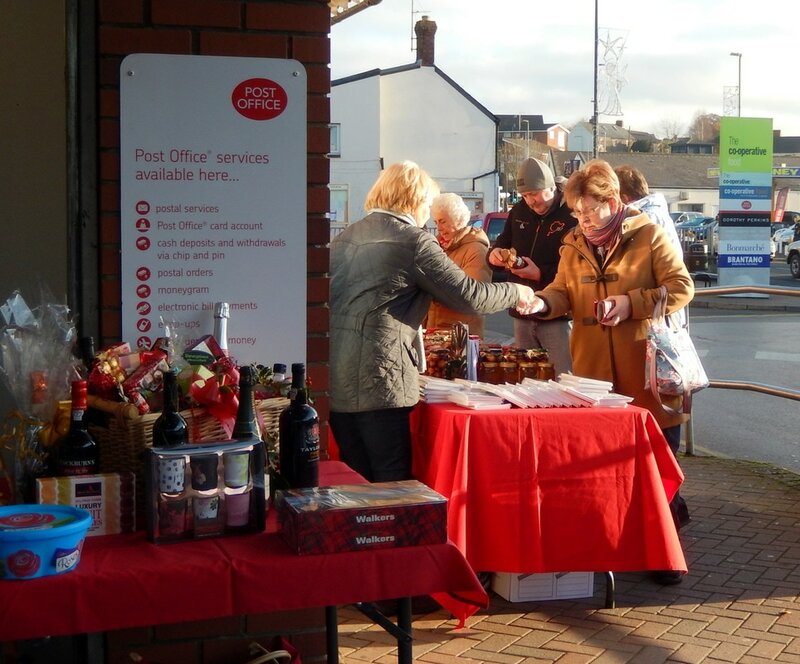 In late November tickets were sold outside Lydney Co-op for the annual Christmas raffle, with supporting stalls selling jams and pickles, 'Friends' Christmas cards, and an impressive array of bric-a-brac. 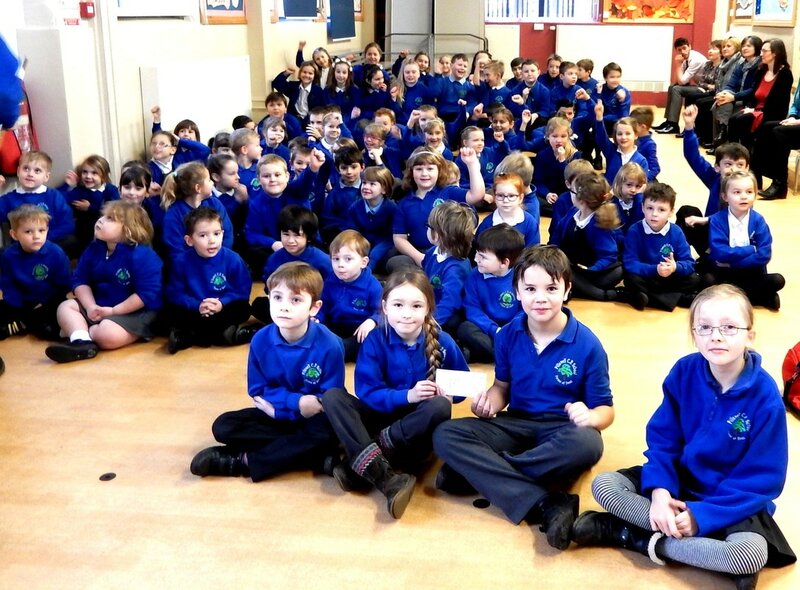 £957 was raised through the generosity of local people - thank you everyone! 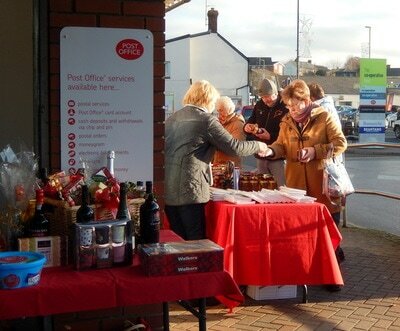 Christmas cards are available and sold every year to support the 'Friends'. The photos used for our 2016 Christmas cards were supplied by three local photographers: Alan Bowkett, Mike Davies and Steve Cooper. 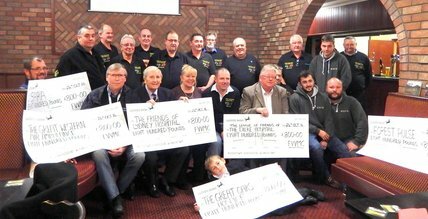 In October 2016 customers and staff at The Globe, Alvington, chose the Friends of Lydney Hospital to benefit from the sum of £304 raised at their very first Harvest Auction and Supper. 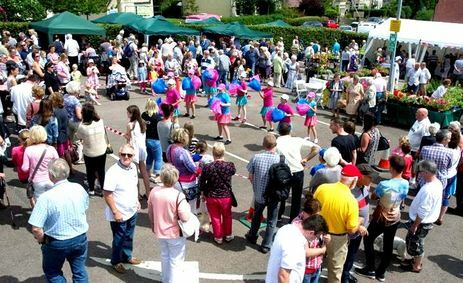 Parkend Silver Band opened the 2016 Annual Hospital Fete at 1.30 and entertainment was later provided by the ukulele band ‘Friends Uke-nited’, the Severnbanks Cygnets cheerleaders and dogs from Forest Oak Dog Training Club. The Severn & Lydney Flower Club held their annual Members’ Flower Arranging Competition – the ladies were kept busy creating fresh flower arrangements for sale; the club also provided a beautiful arrangement as a prize in the Grand Draw. 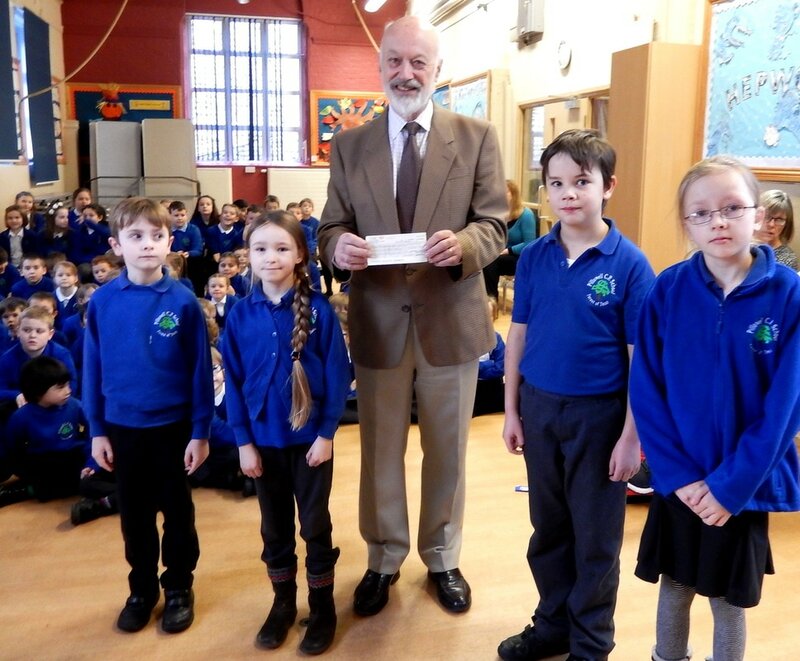 Brian James, Treasurer of the Friends, announced that funds raised this year amounted to just over £12,000. This year the Friends aim to fund a state-of-the-art X-ray facility and this year’s sum will contribute directly to this purchase. We are grateful to those local businesses and organisations who presented cheques at the fete on Saturday (Coventry Building Society, Bream Flour Mill, Lydney Amateur Dramatic Society, and the FOD Lions Club), and also for the hard work of the many local people and businesses who gave donations, raffle prizes, produce and plants, and of course their time so generously. October 2015. 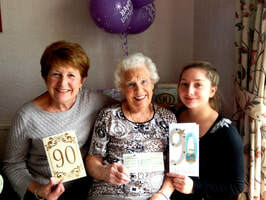 Berenice Carpenter of Lydney recently celebrated her 90th birthday with a party at 3 Hill Street, Lydney. Rather than birthday gifts, she asked her friends to make donations to the Friends of Lydney Hospital. 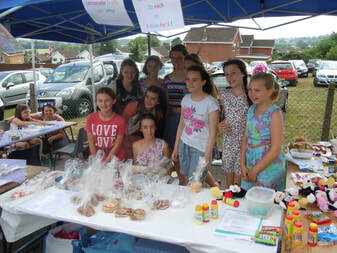 The sum raised was £210.00. Holding the cheque, Berenice is pictured with Trish Morse (daughter) and Harper Morse (eldest of four great-grandchildren). In early September nursing staff at Lydney & District Hospital and Dilke Memorial Hospital each held a ‘nurses tea party’. Amongst those in the group pictures below are Kim Spencer, Alison, Lisa Bennett, Angela Jones, Sally White, Jill Drew, and Karen Williams. Members of staff decided it would be good to hold an informal event for patients and families to come along and enjoy tea and cakes with the nurses. Group picture: Lucy Edmunds (daughter of Denise), Denise Edmunds, Kim Maitland, Kiera Maitland (daughter of Kim). 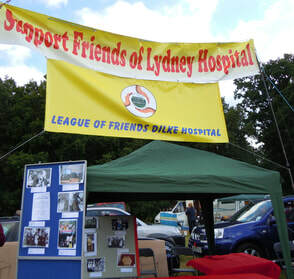 The Friends of Lydney & District Hospital held their annual fete on Saturday 18th July 2015. 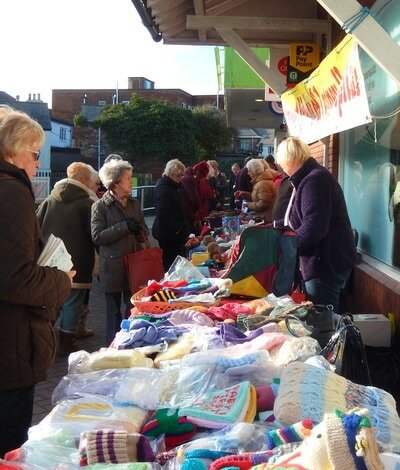 ​The beautiful sunshine brought out the crowds. 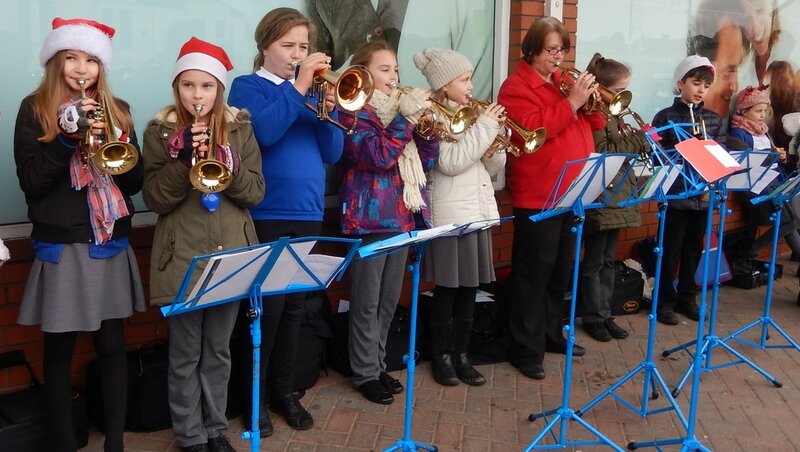 In addition to a large number of side shows and stalls, entertainment included music by Pillowell Silver Band and the ukulele group ‘Friends Uke-nited’, and performances by the Severnbanks Cygnets cheerleaders and dogs from Forest Oak Dog Training Club. Off-duty nurses generously provided tea and home-made cakes, and staff on duty were seen wheeling in-patients around the fete to their obvious delight. The Severn & Lydney Flower Club held their annual Flower Arranging Competition, and provided a beautiful flower arrangement for the Summer Draw. Chairman of the Friends of Lydney Hospital Anthony Midgley said: “We sincerely thank all our supporters, and the people of Lydney and the Forest of Dean for their generosity and their ongoing contribution to the welfare of the hospital and its facilities.” Brian James, Treasurer of the Friends announced that funds raised this year amounted to just under £13,000. This year, a major collaborative project has been completed jointly funded by the Friends and the NHS Trust responsible for the hospital. 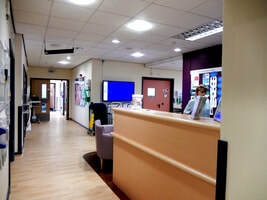 The project, costing in excess of £100,000, has totally refurbished and updated the in-patient ward management and reception area making it more attractive and efficient for patients, staff and visitors alike. Anyone familiar with the previous layout will immediately notice the improvement, and very positive comments have been made by numerous people. Additional work was carried out in parallel to improve bathroom facilities and other essential features of in-patient care. Without joint funding, this substantial improvement would not have been possible. 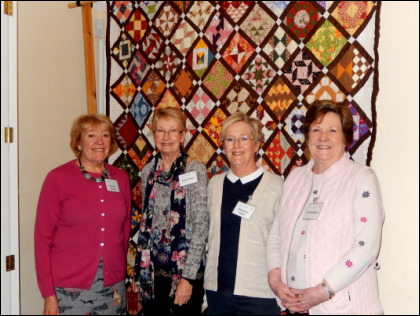 Pictured in front of a beautiful quilt made by Sue Osbourne are Lydney Quilters committee Maureen Jackson, Pam Emery, Katharine Smith and Pat Markham. 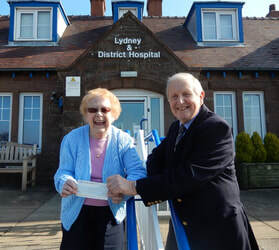 Lifelong Lydney resident Mrs Joan Prosser celebrated her 90th birthday and asked her friends to make donations for the Friends of Lydney Hospital instead of gifts. On 7th April 2015 Joan presented Treasurer Brian James with a cheque for £100. April 2015 - New reception area at Lydney & District Hospital, cost £70,000, jointly funded by the NHS and the Friends of Lydney Hospital. 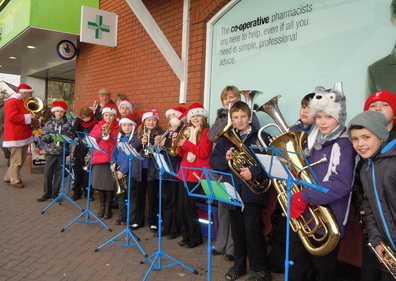 On Thursday 17th January 2015, children from Pillowell County Primary School presented the Friends of Lydney Hospital with a cheque for £239.25 raised through their own efforts since the start of the school year, including the school Harvest Festival and the Band and Choir playing their instruments and singing carols outside Lydney Co-op in December. A Charity Ball hosted by Stroat-based firm ReeceR Space was held at the St Pierre Hotel & Country Club on Saturday 15th November 2014. The event included a raffle and auction of goods and services generously donated by local people and businesses. 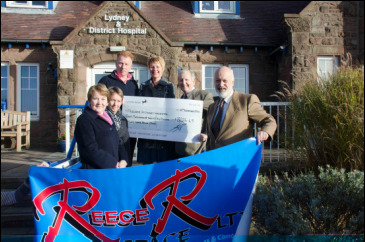 A presentation took place at Lydney & District Hospital when a cheque for £8,026.00 was handed to Chairman of the Friends Anthony Midgley by Steve Reece, proprietor of ReeceR Space. In the pouring rain the ATC drummers manfully ‘drummed in’ Richard Cryer Non-Executive Director of NHS Gloucestershire Care Services at the opening of the 2014 Annual Hospital Fete on Saturday. While welcoming all to the fete, he thanked volunteers, stallholders, performers and sponsors for their generosity, hard work and enthusiasm. Though the weather did gradually improve, many turned up at 2.00 for the opening in spite of the rain, thunder and lightning! On display was a big red fire appliance from Lydney Fire Service complete with a full (and fully kitted!) complement of six burly firemen, in fact they were ready to respond if a ‘shout’ came in! 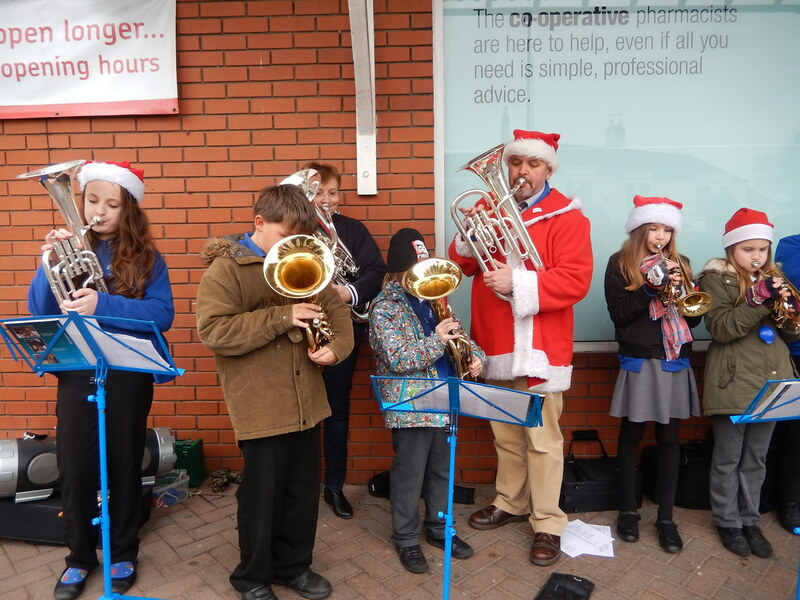 Music was provided by Bream Silver Band in their striking red uniforms, ‘Forest Ukuleles’ who made a surprisingly sweet sound, and ‘Top Cat’ duo Tom and Caroline entertained us with popular songs. One or two entertainers were unable to attend due to the weather but this did not dampen the occasion. Organisers of the produce, jam and cake stalls were concerned that lovely home made jam and cakes may still be there at the end of the afternoon – but no, it all disappeared just as it does every year. Nurses from the hospital generously provided tea and cakes. 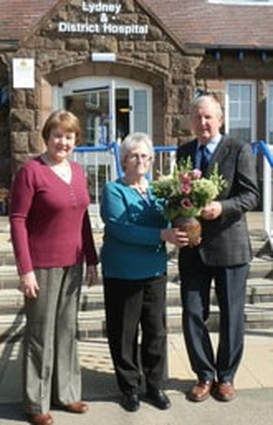 In Stonebury House, the Severn & Lydney Flower Club once again held their annual Members’ Flower Arranging Competition. 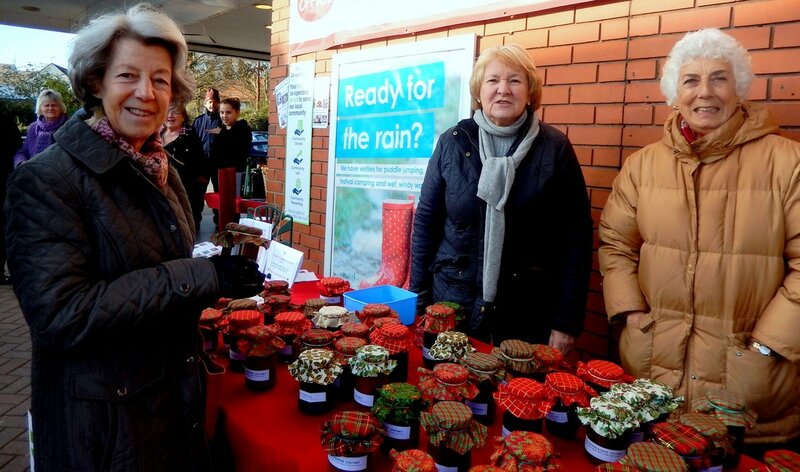 The Flower Club ladies prepared pretty basket arrangements of flowers to sell for hospital funds. The Club also provided a large flower arrangement as a prize in the Summer Draw. The winner of the main prize is Joan Williams who chose to ‘take the money’ - £200 cash! Lucky winners of other prizes have been notified. Over the last year the ‘Friends’ have been able to purchase a range of items directly related to the treatment and/or comfort of patients in the hospital; this year the money raised will go towards improvements to the Reception area for the wards of the hospital. During the afternoon hospital staff manned a stall to encourage potential volunteers. If you are interested in providing practical help at the Hospital contact Kathy Watts on 01594 847400 or kathywatts@watts-group.co.uk. 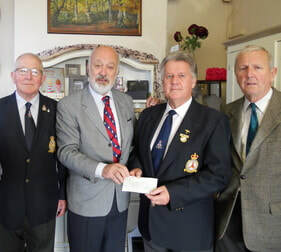 The Forest of Dean Vintage Vehicle & Machinery Club donated the sum of £500 each to the Friends of Lydney & District Hospital and the Friends of the Dilke Hospital. Each year the club holds the Speech House Vintage Show, a major event which attracts enthusiasts from all over the country. 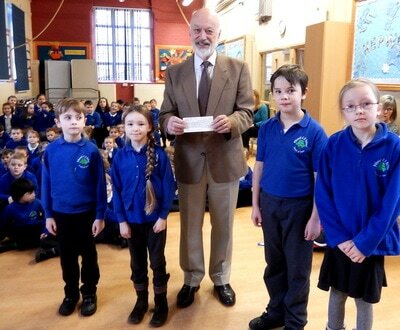 Monies raised are shared among many worthwhile causes in the Forest of Dean. This presentation was made on 8th December 2014. 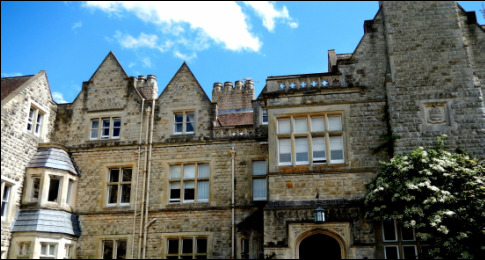 By kind permission of Viscount and Viscountess Bledisloe to mark the opening 50 years ago of the Physiotherapy Centre erected in memory of Charles Bathurst, first Viscount Bledisloe, a special fundraising lunch event was held on 10th May 2014 at Lydney Park Mansion. The beautiful gardens were open to visitors. On 10th April 2014 - 'repose boots' were presented to the hospital. These were funded by generous donation from the Coventry Building Society Lydney. 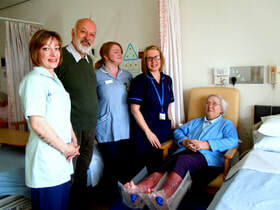 One pair was demonstrated by patient Mary Reid; with her are Elisa Matthews (Health Care Assistant), Anthony Midgley (Chair of Friends), Sarah Bland (Staff Nurse), Karen Williams (Senior Sister). 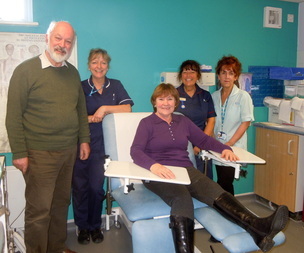 In February 2014 a ‘plastering chair’ was presented to staff within the Minor Injuries Unit. Pictured are: Anthony Midgley (Chair of Friends), Emergency Nurse Practitioner Alison Meek, Angela Davies (Friends and ‘patient’), Matron Mandy Hampton and Healthcare Assistant Lesley John. 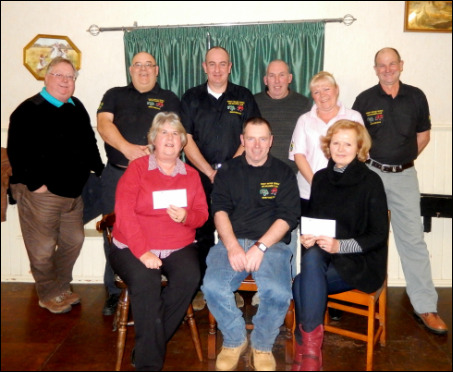 A cheque for £450, the amount raised by customers of the Tufthorn Inn at Milkwall, was presented by the landlord on 10th February 2014. In the picture are: Anthony Midgley (Chair of Friends), Mary Thurston (Friends), Janet Crook, Jack Crook (Landlord), Jim Mark and Sue Mark. On the morning of Wednesday 25th December ‘Father Christmas’ visited all patients in Lydney Hospital who were not well enough to go home for Christmas. Father Christmas (Mr Jim Blatchley) was welcomed by staff at 7.30 am; he was conducted round the wards, having a little chat with each patient and handing over a gift provided by Friends of Lydney Hospital. 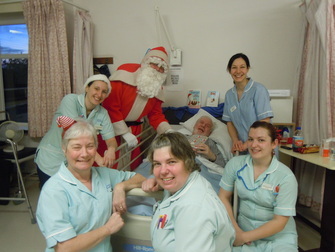 Pictured is patient Richard Archer with Father Christmas and, from left to right: Nicky Cook, Gill Patrick-Gleed, Tara Isles-Potter, Amy Reed and Vicky Whittington. 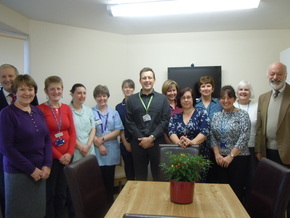 ​Unveiling of refurbished staff room on 17th December 2013, paid for by Friends of Lydney Hospital. Pictured with Brian James and Angela Davies of the Friends on the far left, and Anthony Midgley (Friends Chairman) on the right, are staff members Angela Kay, Nicky Cook, Denise Edwards, Susan Larrington, James Willets, Kay Howells, Michelle Slater, Gill Drew, Mandy Hampton and Mary Howells. 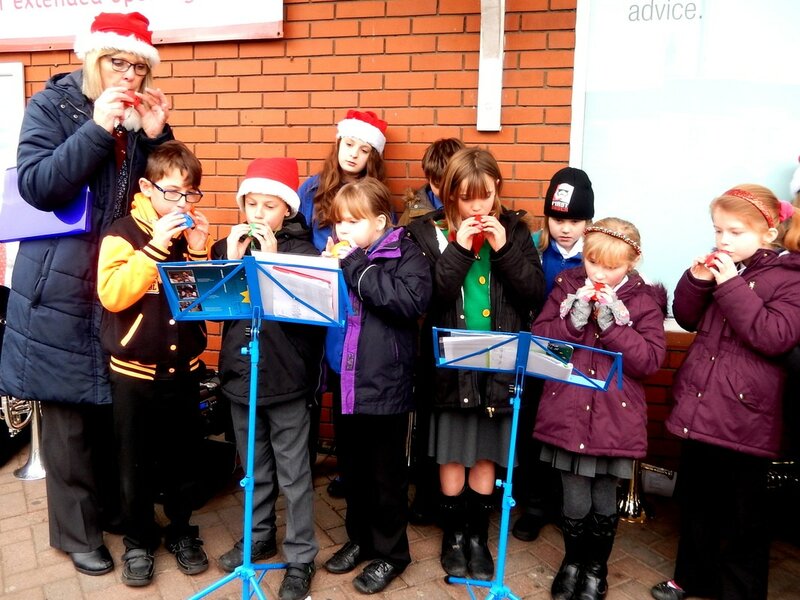 On 6th December 2013 children from Pillowell School played and sang carols all morning outside the Co-op store in Lydney. 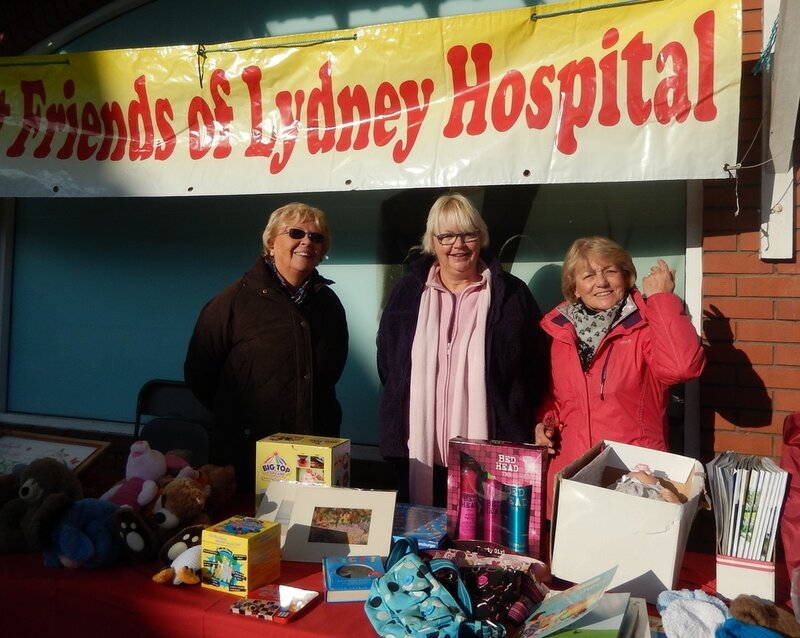 This is an annual event where all the funds raised are handed to the Friends of Lydney Hospital. 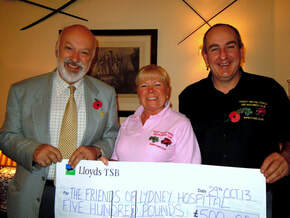 On 29th October 2013 at Speech House, Mark Harris (right), Chairman Forest Vintage Vehicle & Machinery Club and Sharon Vickers, Club Secretary, presented the Friends of Lydney Hospital with a cheque for £500.00, gladly received by Chairman Anthony Midgley (left). This was part of the Club’s charitable donation to local organisations, including the Friends of the Dilke Hospital, who received a share of the £4,000 raised at their Speech House Vintage Show on 7th September. Working together with Friends of Dilke Hospital, a stall was manned at the Forest Vintage Vehicle and Machinery Club Vintage Show on 8th September 2013. This was a joint effort to help raise the profile of both 'leagues of friends'. Members of the committee of the Friends of Dilke organised a balloon race which was very popular. The balloons were launched at 4.00 pm to create a burst of colour above the Speech House field. 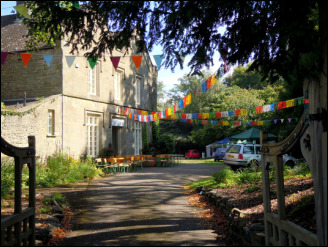 Friends of Lydney Hospital organised and staged a quiz featuring 12 photographs relating to both hospitals including some images from the early 20th century. attractions. 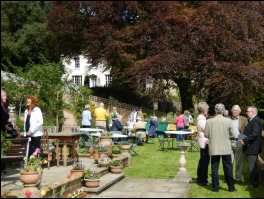 A choice of refreshments was available, such as home-baked cakes, freshly cooked burgers, strawberries and cream and ice cream. 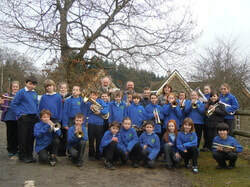 An arena was roped off during the afternoon for a display of ‘dog heelwork to music’ from Carol and Michelle of Forest Oak Farm; Lydney Training Band, comprising mostly young people, provided a background of rousing brass band music. 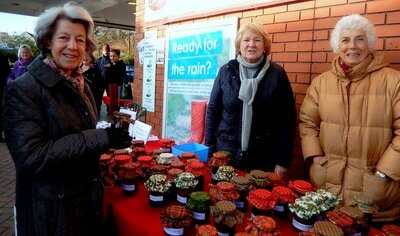 The Severn Lydney Flower Club added to the colour with their displays of lower arrangements. Later in the afternoon the Grand Summer Raffle was drawn. The winner of the main prize is Kathleen Hall of Woolaston who chose to take the cash prize of £200 to help pay the costs of training her AID dog Starr. For a picture slide show visit page Fete 2013.
completed their very own version of the Tour de France. They cycled an impressive 550 miles over six days around the building society's branch network of 70 branches in a 'Tour de Branch'. 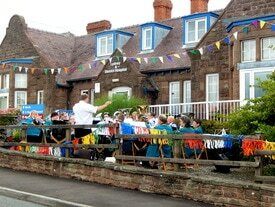 On Wednesday 24th July Lydney branch was the starting point for Stage Three. The cyclists covered around 100 miles per day, starting from Sheffield; the third day was 80 miles from Lydney to Frome in Somerset. Their final destination was the Society's Coventry High Street branch. to see the different branches and their fundraising ideas. The staff at the Lydney branch are having all sorts of fun raising money for their community partner. 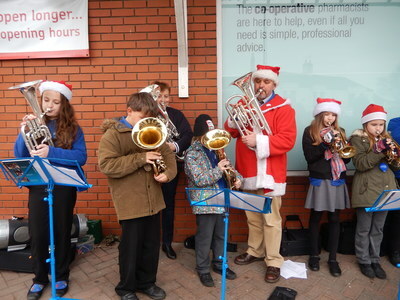 In all we hope to raise around £25,000 for various charities." 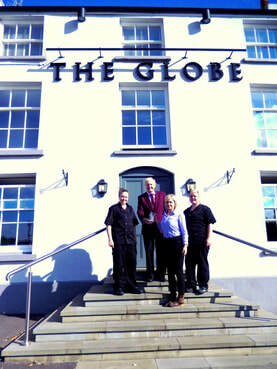 This year the winning local applicant is Friends of Lydney Hospital. In the picture, before the cyclists set off from Lydney, with ‘Friends’ Sheila James on the left and Anthony Midgley and Brian James on the right. In May 2013 we lost a special member of the committee of Friends of Lydney Hospital. This tribute to John Hale MBE appeared in The Forester: 'Gentle giant who transformed the lives of thousands'. Baroness Jan Royall of Blaisdon led the tributes to Bream health campaigner John Hale MBE, who has died aged 89. John played an instrumental role in saving the Forest’s hospitals in 2006 and dedicated his life to helping the community. His daughter-in-law Jacky – a Methodist member – led the funeral service at a packed Springfield Methodist Church in Lydney last Friday. A railwayman by trade, John spent more than 20 years as secretary to the Bream Health Forum (now the Forest Health Forum). 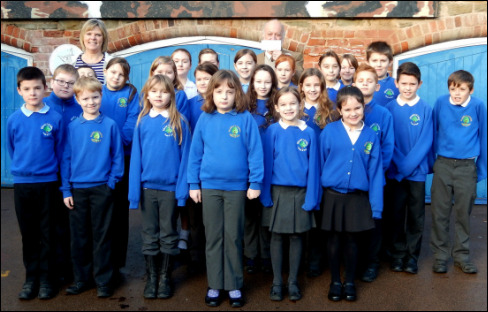 He was a governor of Bream CofE Primary School for 15 years and also served as a parish councillor. 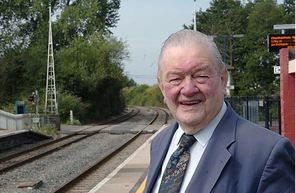 He was awarded the MBE in 2008 for promoting health services in the Forest and his prominent role in the campaign to save both the Dilke and Lydney hospitals in 2006. A generous cheque presented to Anthony Midgley by Polly McConachie. This was raised by Polly (nee Aldridge) and her husband Rob McConachie when they held a special party with the theme '101 Dalmatians'. Polly grew up in Whitecroft where her father Geoff 'Gruffy' Aldridge, 92, still lives. 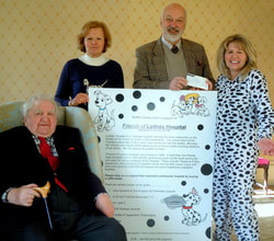 Holding the large poster, left to right: Geoff Aldridge, Mary Thurston, Anthony Midgley, Polly McConachie (wearing the Dalmatian 'onesie'). 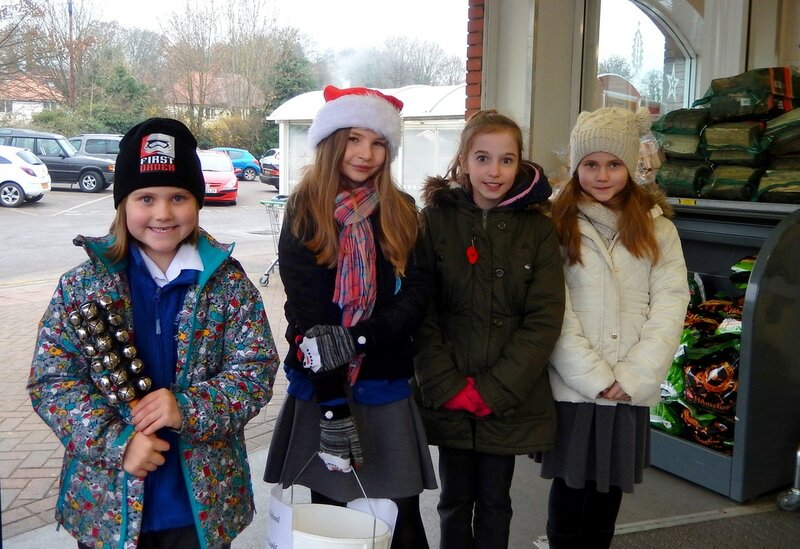 On a cold December morning, pupils of Pillowell School sang carols outside the Co-op store in Lydney, raising the magnificent sum of £190! 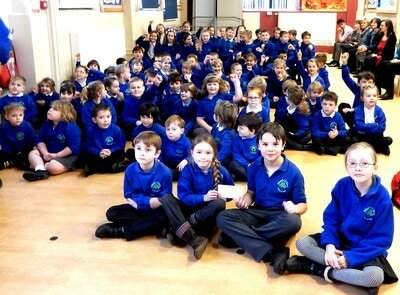 This was duly presented to Anthony Midgley by the children on 13th January 2013. 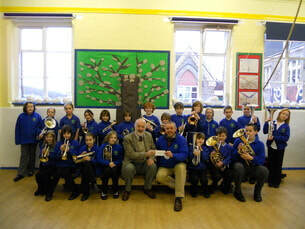 Pillowell School Band and choir presented a cheque for £155 to Anthony Midgley of the Friends of Lydney Hospital. The money was collected when the young musicians played and sang outside the Coop store in Lydney. 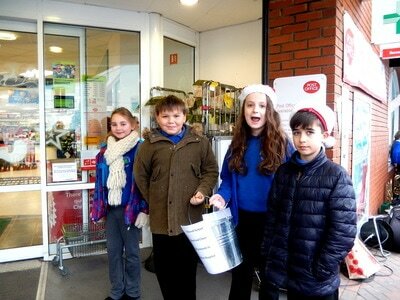 Mr Wilding said the children enjoyed the experience, adding: “It is good for them to give something back to the community”. 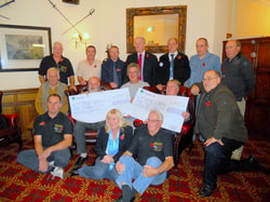 The club presented generous cheques to both Lydney and Dilke Hospitals. 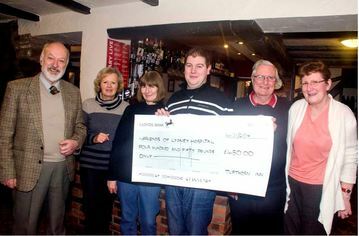 On Tuesday evening 1st May 2012 a cheque for £400 was presented to Ron Beddis of the Friends of Lydney Hospital. The presentation was made by Chris Martin, Station Commander at Lydney Fire Station. 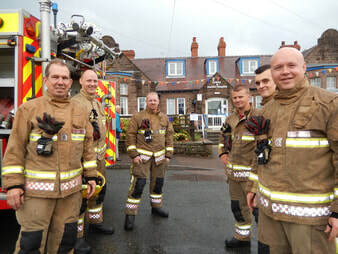 Each year crews from the local station make a collection in aid of the Friends. 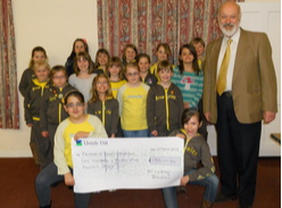 On 22nd March 2012 a cheque for £155.00 was received from 1st Lydney Brownies. 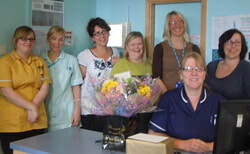 Verna Wheeler retired on 20th March 2013 after 31 years with Lydney & District Hospital. During this time Verna has spent short periods at the Dilke and Tewkesbury hospitals, but Lydney is where her heart is! 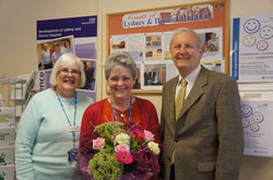 Verna, whose latest role has been Emergency Nurse Practitioner, was presented with a bouquet of flowers and a gift by Brian James, Treasurer of the Friends of Lydney Hospital. She will be much missed, and Ward Manager Michele Slater and her staff hope that Verna will continue to support Lydney Hospital. 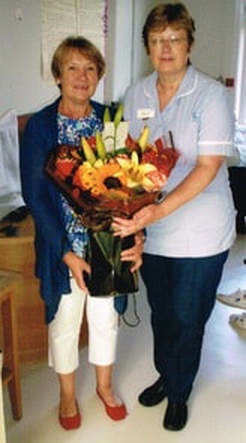 Flowers presented by Angela Davies to Jane Willmer RGN, retiring after 19 years at Lydney (40 years with the NHS). Flowers presented to Audrey Davies, Healthcare Assistant, retiring after 22 years. ​l-r: Angela Davies, Audrey Davies, Mary Thurston. June Rickards (centre) Theatre Health Care Assistant, started working for the NHS in October 1974 and retired after 38 years. 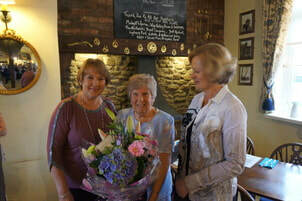 June was presented with her flowers by Angela Davies and Brian James of Friends of Lydney Hospital. 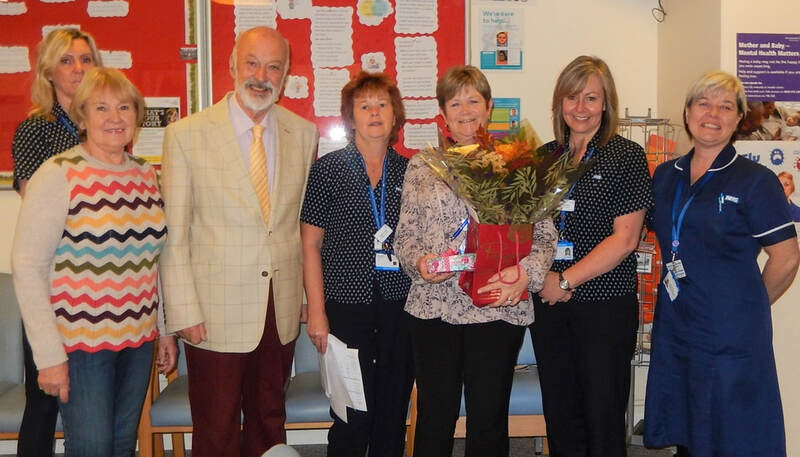 Janice Robinson, Outpatients Receptionist at Lydney, received a presentation of flowers from Friends of Lydney Hospital on her recent retirement. She had been with the NHS for 13 years. From left: Mary Howells, Theatre & Outpatients Admin Manager, Janice Robinson, Brian James of the Friends.